If you’re going out hiking, you really should have a first aid kit with you when you walk. It should only take up a small amount of room in your backpack, and you may never need it, but its usefulness in the event of an injury is priceless. If you’re taking a day hike, you’ll only need to carry a few items. For longer walks you will have to pack a more thorough first aid kit, but one that still weighs little and takes up hardly any room. Pack a small pair of scissors, which can have so many different first aid uses. Add to that a pair of tweezers, good for removing splinters as well as pieces of gravel and grit from a wound, and latex gloves to prevent the spread of infection. Finally, make sure you have safety pins for securing bandages. If you’re on a longer trip with other people, buy an isolaid personal resuscitator. This is a device that’s made for give mouth-to-mouth resuscitation, but as it’s a membrane there’s no contact or bodily fluids exchanged when it’s used. It only takes up a little room. It’s important to have a variety of bandages for different wounds and injuries you might encounter. For day hiking you can get by with a very basic kit, including a few sterile dressings, some 50mm by 50mm, some a little larger, and a long crepe bandage. On top of that you’ll require a selection of self adhesive bandages for cuts. Longer trips will require more, adding in some dumbbell sutures, as well as open wound dressings, some small, some long, and tape for securing them. Be sure to replace bandages after you’ve used them so there’s never any danger of your first aid kit running out. Check your first aid kit regularly. That way there’s no danger of you being short of something you might need. It only takes a minute, and it truly is a case of better safe than sorry. It’s vital to cleanse a wound, so you need items that can do that. Antiseptic wipes will do the job while taking up very little room, and you should also pack a tube on antiseptic cream in your kit. Between them, these two items will be able to cleanse most things. Also carry a supply of paracetamol. You’ll find that on any trip they’ll be used a few times, for different things from headaches to mild inflammation. It’s important not to overpack your first aid kit. You simply can’t be prepared for every eventuality. You need something that will fit easily into your pack and yet take care of the basics. The more you know about first aid, the greater the use you’ll be able to make of what you have. 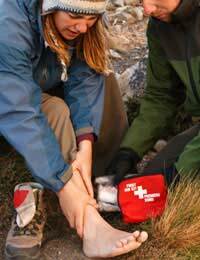 Taking a first aid course is worthwhile for anyone, especially those who spend a little time out in the wilds. Courses are easy to find and held all over the country. The small amount of time spent each week is an investment. Keep the kit in your backpack; don’t remove it other than to check your supplies. That way you won’t accidentally forget it when you leave on a hiking trip. Just a note to say that latex gloves are no longer recommended for first aid use due topossible allergic reaction. Use blue nitrile gloves instead.